Tauw France is an independent firm of consulting engineers, an affiliate of the Dutch group Tauw, a leader in environmental consultancy. One of its activities consists in assessing contaminated site pollutions and designing management solutions. Tauw France aims at supporting remediation solutions for customers and the public administration. To fulfill this objective, the consulting firm relies on Kartotrak.one for the visualization of the environmental data and geostatistical modeling. 2/ to secure the solutions proposed in the remediation plan and improve decision making in terms of efficiency criteria and residual health risk compatibility with their intended future use. Empirical approaches (expert judgment) and simple 2D interpolation skew the estimations. Since source zones exhibit large spatial variations of concentrations at a small scale, modeling uncertainties secures the delineation of the treatment areas. integrate and analyze the data collected during different site assessment phases: land elevation, soil logs, indirect observations (color, odor), onsite measurements (PID, XRF…), contaminant analyses on samples (soil, groundwater or soil gas), position of buildings. design the remediation solutions: soil volume of the treatment zone, mass of contaminants in this volume, remediation objectives, decontamination thresholds, operational constraints (depth of the treatment zone, under/above ground utilities, groundwater table, slopes of the excavation pit, etc.). 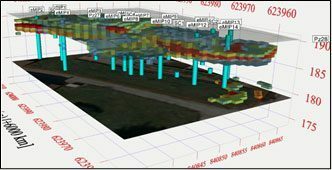 When planning remediation for this case of contaminated urban brownfield, all available data (land elevation, lithology, contaminant concentrations) was loaded into Kartotrak.one, allowing the compilation of chlorinated solvent concentrations in different matrices (soil, groundwater, soil gas, sub-slab and sewage systems gas phase). 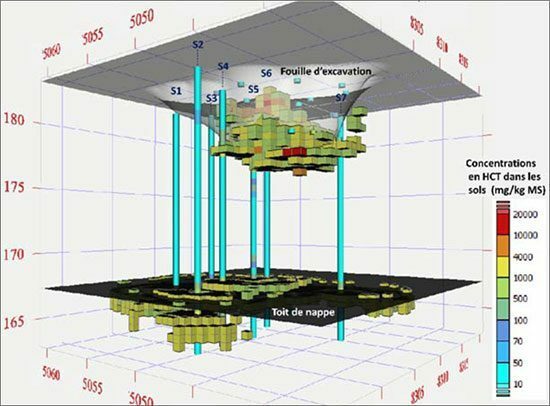 Tauw France was able to model hot spot zones and to highlight off-site pollution pathways for both liquids flowing on top of the clay formation and vapors diffusing along the underground utilities. Additional investigation plan was drawn from this Conceptual Site Model. In the early stages of remediation design, Kartotrak.one models enabled to draw metrics for each scenario (e.g. surface area and volume of the treatment zones, removed contaminant mass), thus supporting the selection of remediation objectives. These metrics are valuable input for the cost-benefit analysis and reinforce the decision to the optimal solution. This approach ensures a better control of costs, deadlines and residual pollution levels relating to the selected solutions and brings justifications to clients and administrations. When re-developing former industrial sites where future buildings lie above contaminated areas, it is advisable to plan ahead the constraints imposed by the remediation works on construction and those imposed by the development project on the treatment zones. On a site contaminated with PAHs, models allowed Tauw’s engineers to design the geometry of the excavation pit accounting for both construction requirements (basement floor, pit slopes, receding zone at the base of the pit, etc.) and contaminated zones to treat (health risks, integrity of concrete, geotechnical stability). Integration of these constraints at an early stage enabled to estimate the excavation volumes required by the project (building foundations and overdeepening), the offsite treatment facilities able to treat each volume, the additional costs to adjust constructions after excavation (soil supply and compaction, slabs reinforcement) while achieving remediation objectives and acceptable health risks for future uses. 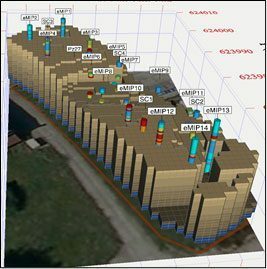 Excavation plans modeled with Kartotrak.one were also used to prepare remediation works (surface area of the excavation pit, gridding and phasing, reception protocols). In this case study, the estimated and the actual volumes sent to the treatment facilities differed by 10-15% mainly because of the detection of tar during construction works that was not measured during the assessment phase despite a dense grid in the assessment phase (1 borehole every 5 m).